Paper Yak: I made a dress! Yes, you read right, I have made a dress! Why is this special, I hear you cry? Well, to be honest, it's special because I didn't bodge it! 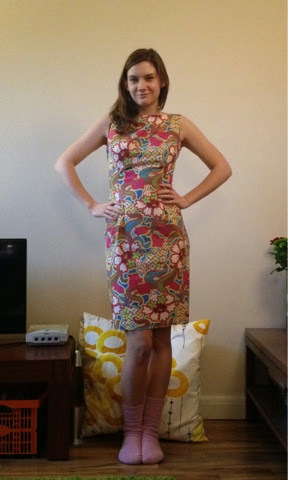 This may be the first hand-drafted dress I have made where I have finished all the seams and sewn it properly. 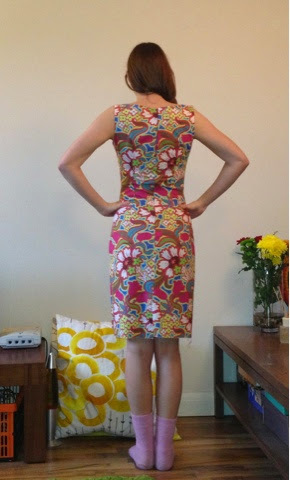 I made the pattern myself based on an old shift dress I temporarily took apart and then altered it to perfect the fit. I also drew up a re-useable pattern so I can knock it up again in super swift time. The only thing I didn't do with this dress is line it and that's only because I ran out of fabric. The fabric is actually quilting fabric which is super expensive (£15/m instead of my usual £3/m) so I managed to squeeze this dress out of 1m of fabric. If I was doing it with cheaper fabric, I'd self line the top and bind the seams to make it a bit nicer on the inside. Oh and I found out that my sewing machine can do a fake overlock that seems to work really well! Not quite the same toughness as a traditional overlock and you have to pre-trim it, but my word is it easier than turning tiny seam allowances! The fabric is actually a lot brighter in real life, just in time for spring... Hurray! I will definitely be making this dress again, I've even got my eye on some fabric - if only I could afford it! Ah, student life!